Tonight, college basketball’s biggest rivalry will be on display for the first time this season when the North Carolina Tar Heels host the No. 8 ranked Duke Blue Devils in what should be a heated ACC battle. Just how heated, you ask? 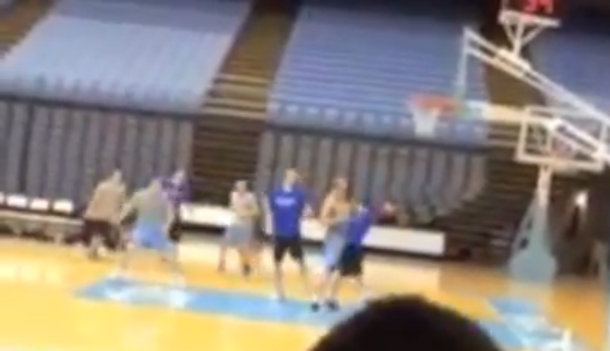 Well, if the annual Managers Game—which took place on Tuesday—is any indication, very heated. In addition to winning the game, 38-33, the Tar Heels managers also appeared to win the war—especially in the paint, where at least one Tar Heels player was even throwing elbows just to win a battle for a rebound. And, not surprisingly, that resulted in a scuffle between the two sides, which was captured on video by a spectator.